This blog is brought to you by www.meetingstime.com and www.meetingtime.net - 19,600 conference venues worldwide.Register here and post or comment any existing post or send your post or your comment to + kangocorp (at) yahoo.com + and we'll do the job for you. (Please allow 72 hours). Follow us as soon as you have time. You are always welcome! Go to Kangocorp.com to view a complete Trade Fairs calender. ProSweets and ISM Cologne 2019 end January 30 - Hurry Up! 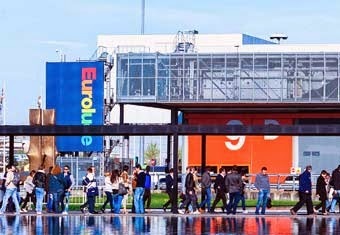 This year Euroluce, the biennial exhibition devoted to excellence in the world of lighting, celebrates its 28th edition, and continues its mission to showcase the very latest in lighting solutions for homes, offices, hospitality and the outdoors, as well as light sources and lighting design software. You can register, or entrance cards can also be purchased upon registration at the reception desks. chamber of commerce, or equivalent document. When purchasing Hotel Furniture products, you can have peace of mind that you're choosing furnishings of enduring quality. You must be assured about superior quality through selection of materials and lumber, product design and engineering. http://www.webtaylor.it/. Simple theme. Theme images by Maliketh. Powered by Blogger.